The following terms of agreement have been created to align our panel installation terms of agreement with The Approved Code of Practice for Cranes, The Approved Code of Practice for Load-Lifting Rigging and The Approved Code of Practice for The Safe Handling, Transportation and Erection of Precast Concrete as published by WorkSafe New Zealand. By following the preferred work practices of these approved codes we ensure our activities for our principle by our employees and sub-contractors can clearly show compliance the Health and Safety in Employment Act 1992. A Court may therefore consider this to be compliance. Bolt in these terms of agreement shall mean a temporary fixing consisting of a 18mm x 105mm Load controlled expansion anchor. ACOP in these terms of agreement shall mean the Approved Code of Practice for The Safe Handling, Transportation and Erection of Precast Concrete. 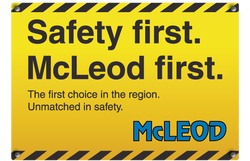 McLeod in these terms of agreement shall mean McLeod Cranes Ltd, or McLeod Hiabs Ltd as the context requires, or any agents or employees thereof. 1. A signed acceptance of these terms of agreement is required for our quotation to be deemed a job and for the appropriate job scheduling to commence. 2. All bookings must be made in writing 7 days prior to commencement. 3. All rates are GST exclusive. 4. Our quotation is not subject to any heads of agreement entered into by the main contractor, owner or developer but deemed to be a contract between McLeod and the main or named contractor in our quotation. 5. Any deliveries/collections of additional equipment for setup and or lifting will be charged on an hourly rate bases. 7. If the number or size of Pre-Cast elements changes we reserve the right to adjust our quotation accordingly. 8. Extra work outside of our quotation requires a written instruction and order number. 9. Our quotation allows for the crane to have access inside the building lines. 13.1. Manufacturers certification of compliance for concrete elements (ACOP see Appendix) In the event that the manufacturers certification is not available we must have a signed statement by a competent person granting approval from the main contractor and acknowledging that the Pre-Cast is safe to lift. 13.2. All panels requiring rotation to be designed to withstand rotation. Edge lifters must be used for rotation of Pre-Cast. 13.4. A rigging plan must be provided by the Pre-Cast manufacturer for the crane operator to meet the ACOP(4.3.1). 13.5. All lifting anchors must be installed to the manufacturer’s specifications and be designed for purpose. Recess forms to be removed and lifting anchors operation to be checked by Pre-Cast manufacturer. 13.7. All concrete components being erected which require a drilled in load controlled expansion anchor bolt, must have sufficient surface area to ensure the anchor spacing/edge distance meets the bolt manufacturer’s specifications. c. Allow reasonable access to both sides of Pre-Cast at footing line for shimming and barring. b. Have the top of the Pre-Cast to the rear of the truck (unless otherwise agreed). 13.14. Our Pre-Cast placement team must have dedicated clear space for the installation and to ensure the safety of all personnel on site. Simultaneous operations must take into account the installation programme and not delay the operation. 14.5. Props fixed adequately prior to lifting tilt panels. 15.12. Cleaning recess forms, grout sleeves, drossbach ducts and the like. 15.19. Rotation of Pre-Cast with face lifters. 15.21. Attaching additional strong backs, lifting plates, bolts washers etc. to allow Pre-Cast lifting or rotation. 15.23. Delays beyond our control due to hindrance or interference by the main contractor or sub-contractors activities. These items may incur additional charges of associated costs including labour and vehicle recovery. * May be negotiated into contract or as a variation. 16.1. Mud dropping on the road on exit. 16.4. Damage to lawns, grounds, fences, vehicles or other property during access, exiting or when manoeuvring on site. 17.1. Reinforcing bars/hoops used for lifting eyes (ACOP 3.2.11/2.4.6). 19.4. A pickup and delivery charge will apply with each site visit. 19.6. Initial pickup and delivery may be included in quotation. 19.7. Prop removals and repropping is excluded from this quotation. These Terms of Agreement and our Terms and Conditions (which are available on request) will take precedence over any other conflicting terms and conditions. These terms have been created by the Crane Association of New Zealand technical committee to meet current approved codes of practice.